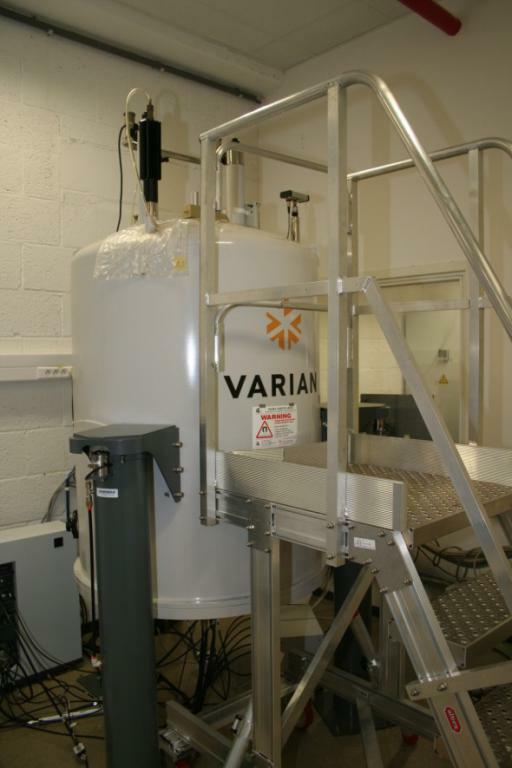 Established in 2010, the Jean Jeener NMR Centre houses state-of-the-art 600 MHz and 800 MHz NMR spectrometers dedicated to structural biology work. 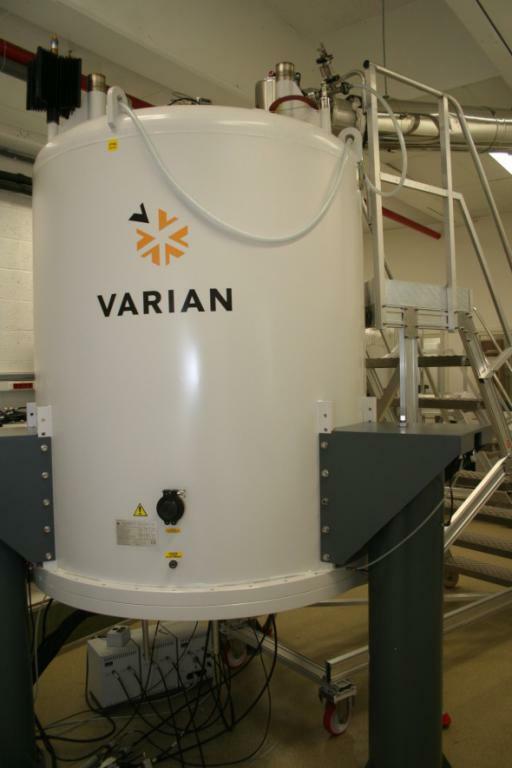 In addition to the main focus on biomolecular NMR projects of the Structural Biology Research Centre and other VIB departments, the NMR centre provides service to third-party academic and indutrial users. A range of service options (including spectrometer time, assistance with the experimental setup, and advanced spectral analysis) are available. Contact us for more details and pricing information. The Jean Jeener NMR Centre is managed by Dr. Alex Volkov and Dr. Lieven Buts. See below for a description of our NMR spectrometers, the NMR Centre's research output, and follow us on Twitter (@BioNMRbe). May 2017 Paper on the CBP ID3 - ZFP interaction by PRE NMR accepted in Sci. Rep. Congratulations to Sara Contreras-Martos! Nov 2018 The APP-GABABR1a story is out in Science. Congratulations to Heather Rice, Joris de Wit and other co-authors! 35. Caselle, E.A., Yoon, J.H., Bhattacharya, S., Rempillo, J.J.L., Lengyel, Z., D'Souza, A., Moroz, Y.S., Tolbert P.L., Volkov, A.N., Forconi, M., Castañeda, C.A., Makhlynets, O.V. & Korendovych, I.V. Kemp Eliminases of the AlleyCat Family Possess High Substrate Promiscuity. ChemCatChem 11, 1425-30 (2019). 34. Rice, H.C., de Malmazet, D., Schreurs, A., Frere, S., Van Molle, I., Volkov, A.N., Creemers, E., Vertkin, I., Nys, J., Ranaivoson, F.M., Comoletti, D., Savas, J.N., Remaut, H., Balschun, D., Wierda, K.D., Slutsky, I., Farrow, K., De Strooper, B. & de Wit, J. Secreted Amyloid-β Precursor Protein Functions as a GABABR1a Ligand to Modulate Synaptic Transmission. Science 363, eaao4827 (2019). 33. Nguyen, H.H., Volkov, A.N., Vandenbussche, G., Tompa, P. & Pauwels, K. (2018) In vivo biotinylated calpastatin improves the affinity purification of human m-calpain. Prot. Expr. Purif. 145, 77-84. 32. Kieken, F., Loth, K., van Nuland, N., Tompa, P. & Lenaerts, T. (2018) Chemical shift assignment of the partially deuterated Fyn SH2-SH3 domain. Biomol. NMR Assign. 12, 117-22. 31. Contreras-Martos, S., Piai, A., Kosol, S., Varadi, M., Bekesi, A., Lebrun, P., Volkov, A.N., Gevaert, K., Pierattelli, R., Felli, I. & Tompa, P. (2017) Linking functions: an additional role for an intrinsically disordered linker domain in the transcriptional coactivator CBP. Sci. Rep. 7, 4676. 30. Huculeci, R., Cilia, E., Lyczek, A., Buts, L., Houben, K., Seeliger M.A., van Nuland, N.A.J. & Lenaerts, T. (2016) Dynamically coupled residues within the SH2 domain of FYN are key to unlocking its activity. Structure. 24, 1947-59. 29. Hubin, E., Cioffi, F., Rozenski, J., van Nuland, N.A.J. & Broersen, K. (2016) Characterization of insulin-degrading enzyme-mediated cleavage of Aß in distinct aggregation states. Biochim. Biophys, Acta 1860, 1281-90. 28. Antonik, P.M., Volkov, A.N., Broder, U.N., Lo Re, D., van Nuland, N.A.J. & Crowley, P.B. (2016) Anomer-specific recognition and dynamics in a fucose-binding lectin. Biochemistry 55, 1195-203. 27. Moroz, Y.S., Dunston, T.T., Makhlynets, O.V., Moroz, O.V., Wu, Y., Yoon, J.H., Olsen, A.B., McLaughlin, J.M., Mack, K.L., Gosavi, P.M., van Nuland, N.A.J. & Korendovych, I.V. (2015) New tricks for old proteins: single mutations in a nonenzymatic protein give rise to various enzymatic activities. J. Am. Chem. Soc. 137, 14905-11. 26. Huculeci, R., Garcia-Pino, A., Buts, L., Lenaerts, T. & van Nuland, N.A.J. (2015) Structural insights into the intertwined dimer of fyn SH2. Protein Sci. 24, 1964-78. 25. Van de Water, K., Sterckx, Y.G.J. & Volkov, A.N. (2015) The low-affinity complex of cytochrome c and its peroxidase. Nat. Commun. 6, 7073. 24. Zorzini, V., Buts, L., Schrank, E., Sterckx, Y.G.J., Respondek, M., Engelberg-Kulka, H., Loris, R., Zangger, K. & van Nuland, N.A.J. (2015) Escherichia coli antitoxin MazE as transcription factor: insights into MazE-DNA binding. Nucleic Acids Res. 43, 1241-58. 23. Van de Water, K., van Nuland, N.A.J & Volkov, A.N. (2014) Transient protein encounters characterized by paramagnetic NMR. Chem. Sci. 5, 4227-36. 22. Sterckx, Y.G.J. & Volkov, A.N. (2014) Cofactor-dependent structural and binding properties of yeast cytochrome c peroxidase. Biochemistry 53, 4526-36. 21. Sterckx, Y.G.J., Volkov, A.N., Vranken, W.F., Kragelj, J., Ringkjøbing-Jensen, M., Buts, L., Garcia-Pino, A., Jové, T., Van Melderen, L., Blackledge, M., van Nuland, N.A.J. & Loris, R. (2014) SAXS and NMR-derived conformational ensemble of the highly flexible antitoxin PaaA2. Structure 22, 854-65. 20. Zorzini, V., Buts, L., Sleutel, M., Garcia-Pino, A., Talavera, A., Haesaerts, S., De Greve, H., Cheung, A, van Nuland, N.A.J. & Loris, R. (2014) Structural and biophysical characterization of Staphylococcus aureus SaMazF shows conservation of functional dynamics. Nucleic Acids Res. 42, 6709-25. 19. Vanwetswinkel, S., Volkov, A.N., Sterckx, Y.G.J., Garcia-Pino, A., Buts, L., Vranken, W.F., Bouckaert, J., Roy, R., Wyns, L. & van Nuland, N.A.J. (2014) Study of the structural and dynamic effects in the FimH adhesin upon α-D-heptyl mannose binding. J. Med. Chem. 57, 1416-27. 18. Ceregido, M.A., Spínola Amilibia, M., Buts, L., Rivera-Torres, J., Garcia-Pino, A., Bravo, J. & van Nuland, N.A.J. (2014) The structure of TAX1BP1 UBZ1+2 provides insight into target specificity and adaptability. J. Mol. Biol. 426, 674-90. 17. Rubio, L., Huculeci, R., Buts, L., Vanwetswinkel, S., Lenaerts, T. & van Nuland, N.A.J. (2014) 1H, 13C, and 15N backbone and side-chain chemical shift assignments of the free and bound forms of the human PTPN11 second SH2 domain. Biomol. NMR Assign. 8, 297-301. 16. De Gieter, S., Loris, R., van Nuland, N.A.J. & Garcia-Pino, A. (2014) 1H, 13C, and 15N backbone and sidechain chemical shift assignments of the toxin Doc in the unbound state. Biomol. NMR Assign. 8, 145-8. 15. Castro-Roa, D., Garcia-Pino, A., De Gieter, S., van Nuland, N.A.J., Loris, R. & Zenkin, N. (2013) The Fic protein Doc uses an inverted substrate to phosphorylate and inactivate EF-Tu. Nat. Chem. Biol. 9, 811-7. 14. Ortega Roldan, J.L., Casares, S., Ringkjøbing Jensen, M., Cárdenes, N., Bravo, J., Blackledge, M., Azuaga, A.I. & van Nuland, N.A.J. (2013) Distinct ubiquitin binding modes exhibited by SH3 domains: molecular determinants and functional implications. PLoS One 8, e73018. 13. Vanwetswinkel, S., van Nuland, N.A.J. & Volkov, A.N. (2013) Paramagnetic properties of the low- and high-spin states of yeast cytochrome c peroxidase. J. Biomol. NMR 57, 21-6. 12. Ceregido, M.A., Garcia-Pino, A., Ortega-Roldan, J.L., Casares, S., López Mayorga, O., Bravo, J., van Nuland, N.A.J. & Azuaga, A.I. (2013) Multimeric and differential binding of CIN85/CD2AP with two atypical proline-rich sequences from CD2 and Cbl-b. FEBS J. 280, 3399-415. 11. Volkov, A.N. & van Nuland, N.A.J. (2013) Solution NMR study of the yeast cytochrome c peroxidase - cytochrome c interaction. J. Biomol. NMR 56, 255-63. 10. Volkov, A.N., Wohlkonig, A., Soror, S.H. & van Nuland, N.A.J. (2013) Expression, purification, characterization, and solution nuclear magnetic resonance study of highly deuterated yeast cytochrome c peroxidase with enhanced solubility. Biochemistry 52, 2165-75. 9. Shah, D.M., AB, E., Diercks, T., Hass, M.A.S., van Nuland, N.A.J. & Siegal, G.D. (2012) Rapid protein-ligand co-structures from sparse NOE data. J. Med. Chem. 55, 10786-90. 8. Van Laer, K., Buts, L., Foloppe, N., Vertommen, D., Van Belle, K., Wahni, K., Roos, G., Nilsson, L., Mateos, L.M., Rawat, M., van Nuland, N.A.J. & Messens, J. (2012) Mycoredoxin-1 is one of the missing links in the oxidative stress defense mechanism of Mycobacteria. Mol. Microbiol. 86, 787-804. 7. Volkov, A.N., Vanwetswinkel, S., Van de Water, K. & van Nuland, N.A.J. (2012) Redox-dependent conformational changes in eukaryotic cytochromes revealed by paramagnetic NMR spectroscopy. J. Biomol. NMR. 52, 245-56. 6. Abskharon, R.N., Ramboarina, S., El Hassan, H., Gad, W., Apostol, M.I., Giachin, G., Legname, G., Steyaert, J., Messens, J., Soror, S.H. & Wohlkonig, A. (2012) A novel expression system for production of soluble prion proteins in E. coli. Microb. Cell Fact. 11, 6. 5. Jensen, M.R., Ortega-Roldan, J.L., Salmon, L., van Nuland, N.A.J. & Blackledge, M. (2011) Characterizing weak protein-protein complexes by NMR residual dipolar couplings. Eur. Biophys. J. 40, 1371-81. 4. Ortega-Roldan, J.L., Blackledge, M., van Nuland, N.A.J. & Azuaga, A.I. (2011) Solution structure, dynamics and thermodynamics of the three SH3 domains of CD2AP. J. Biomol. NMR 50, 103-17. 3. Huculeci, R., Buts, L., Lenaerts, T. & van Nuland N.A.J. (2011) 1H, 13C and 15N backbone and side-chain chemical shift assignment of the Fyn SH2 domain and its complex with a phosphotyrosine peptide. Biomol. NMR Assign. 5, 181-4. 2. Zorzini, V., Haesaerts, S., Cheung, A., Loris, R. & van Nuland, N.A.J. (2011) 1H, 13C, and 15N backbone and side-chain chemical shift assignment of the staphylococcal MazF mRNA interferase. Biomol. NMR Assign. 5, 157-60. 1. Garcia-Pino, A., Balasubramanian, S., Wyns, L., Gazit, E., De Greve, H., Magnuson, R.D., Charlier, D., van Nuland, N.A.J. & Loris R. (2010) Allostery and intrinsic disorder mediate transcription regulation by conditional cooperativity. Cell 142, 101-11.